Here at CF, we love to break down stereotypical fashion barriers. Who says you *can’t* wear something? Who says you *can’t* wear it for that occasion? We’re here to prove the naysayers wrong. When I say “bodycon dress,” the first thing you may think of is the uber tight, see-every-line-and-curve, short dress you *may* have worn to a party or high school Homecoming back in the day. I mean, it’s supposed to stick to the body, right? Well, right! But that doesn’t mean all bodycon dresses have to be inappropriate for class or work settings. Like most outfits, it’s all about the accessories! Are you trying to be flashy, in-your-face, or are you trying to be a hard worker who happens to look insanely stylish, too? I prefer the latter. This particular bodycon dress I found for you is a perfect addition to your class/work/play wardrobe. 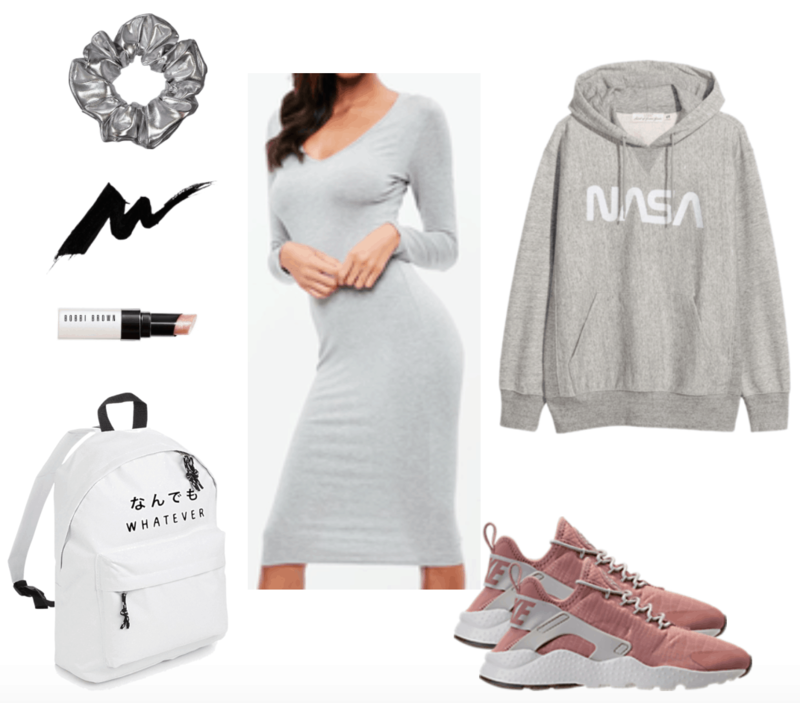 Thank you Missguided for the ideal dress: this $9 grey long sleeve midi dress, with a casual cute v-neckline. Albeit plain, this dress can be adorned in a million different ways, 3 of which I will show you down below. Scroll down to see 3 ways we would wear this dress to class. #CFApproved. For our first look with this dress, picture yourself sitting in class taking down those notes and getting ahead on your studying. Hey, mind over matter. Slip into a classic black blazer for a scholarly look that only gets augmented with black ankle socks and stunning silver loafers. I mean, woah. Don’t be afraid to push your socks down a bit so they kind of look like an afterthought. After all, you’re focused on the books, girl. Slide on your favorite pair of glasses or readers for a definite nerdy vibe, and grab a notebook or portfolio, like this ahdorable polka dotted one from Kate Spade. Stuff it into (okay, place it nicely) in this faux leather backpack. Gold pearl hoop earrings complete this look with a perfectly coiffed accessory. You look great! Can’t picture yourself wearing a dress to class because you barely own a dress? No worries, sporty gal, you can in fact rock a dress and not have to sacrifice your athletic air. Over your dress, throw on a black and white track jacket, or any jacket advertising your sport. If you wanna be extra, have the jacket lay over your shoulders lightly, channeling your inner Kim K. Slip on a pair of black Chelsea boots for a sick street vibe. A red floral necklace adds a bit of glitz, but can be eliminated with no harm done. Swipe on some red lipstick for one more splash of color to contrast this monochromatic scene. Finish this look up with an adorable (+ all too fitting) “Feminist AF” cap, and simple, black Herschel backpack. You are set to jet and look fab. Bodycon Midi Dress Outfit 3: Just Rolled Out of Bed? Me? Never! For our final look today, I bring to you the I-just-rolled-out-of-bed-but-you-wouldn’t-know-it outfit. Because honestly, dresses are way easier to slip on in the morning than pants. Throw on your favorite sweatshirt (or your boyfriend’s) over your dress like this grey NAS sweatshirt found in H&M’s Men’s section. A pair of pink trainers gives you a pep in your step and a much easier time running to class. Throw your hair up in a high messy ponytail, securely fastened with a silver scrunchie. All your goodies can be stored in this awfully cute “Whatever” backpack. Never leave home without makeup? Quickly wing out your eyelids with black liquid liner and throw on a sparkly pink lip tint for that bit of sheen. Nobody will ever know you woke up 5 minutes ago. How do you feel about this week’s FF? 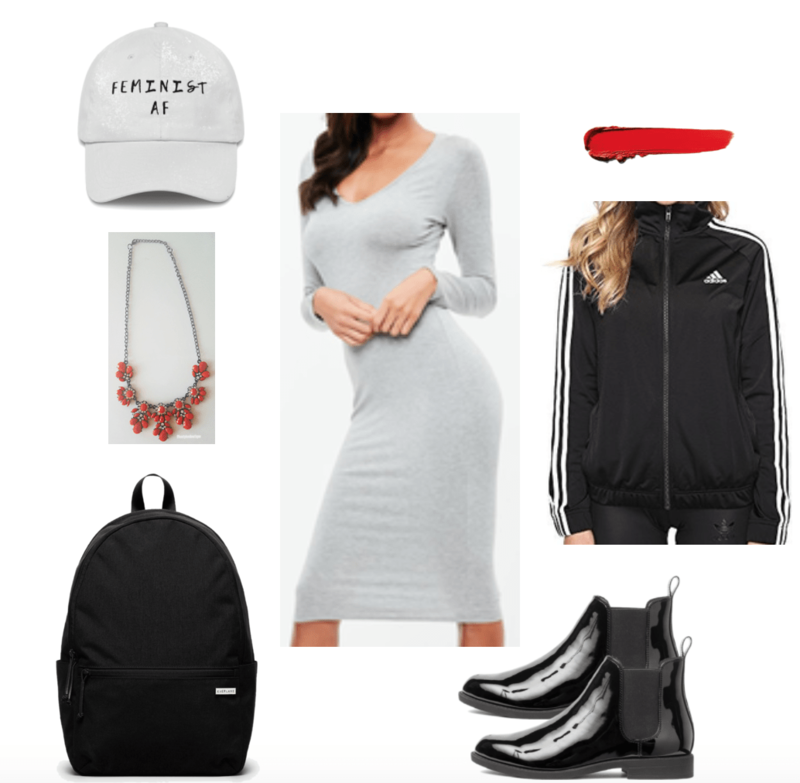 Would you wear a bodycon dress to class? How would you style it? Which is your favorite outfit? Let me know down below.